3M SWIVEL HEAD PAD HOLDER, TWIST & TURNS TO REACH HARD-TO-GET-TO PLACES. 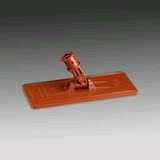 BROWN PAD: SCRUB & STRIP PAD DESIGNED FOR SOIL REMOVAL FROM BASEBOARDS. FOR TOUGH SOIL REMOVAL SUCH AS FINISH & WAX BUILDUP AT FLOOR EDGES. ** Please call us for any questions on our doodlebug scrubber rentals in Fairview Heights IL.